Found this gal in a parking lot for a concrete company in Cartersville, GA. USA. Poss. originally Philidelphia FD. Unk. year of mfg. She's not there anymore. Come-on, we're hanging out for lots more of this sort of classic 'days gone' - I hope to heck you got a few more pics of this old bus up your sleeve! Added by Pavel - Western Australia on 12 December 2007. What a SHAME! just rotting away.Phila purchased several of the model S ladders in early thru mid '60's. I have a passion for MAXIM'S.I can't believe HME would dare to put a Maxim insigna on their new trucks!There was only one Maxim Motor Co.And they knew how to make a firetruck! Added by George on 03 December 2008. Not wishing to be awful, so please don't hate me, but this the first American fire appliance i like! I'd love to see this restored, looks a nice old bit of kit. Added by John Johnstone on 03 December 2008. Hi.John. 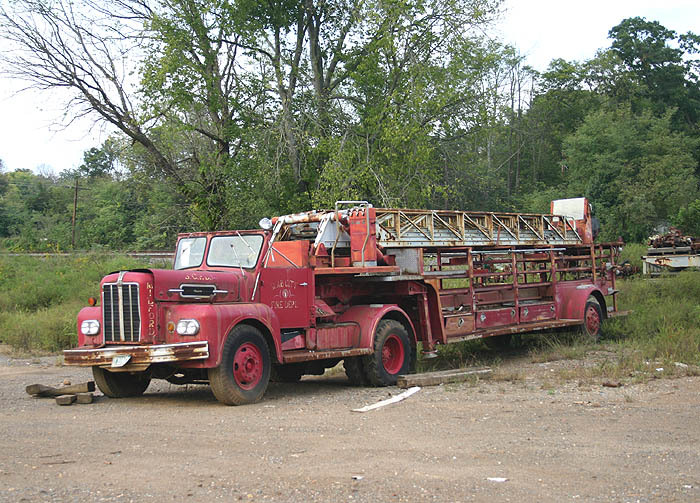 MAXIM was one of the best firetrucks (as far as i am concerned)ever built in america with the exception of the #1 Co. AHRENSFOX!! my 3rd favourite is Young fire appuratus.It is a shame these companies went out of business.All of these companies built trucks with the best craftmanship, that alot of them are still in frontline service! Mr Johnstone, your medication is in the post and you are restricted to looking at Mann / Volvo pictures for a week. Added by John Stott on 04 December 2008. Well then, i guess Mr. Johnstone can look at MACK trucks since they are now owned by VOLVO! Added by George frankenfield on 04 December 2008. George, we call it the Swedish disease, firemen here feel offended when asked if they got their new Volvo from IKEA! Added by John Stott on 05 December 2008. Thank you George for that, i have great respect for all fire fighters and the people who build their appliances, it's always a sad loss when any well respected company closes, i still think in the UK the best appliances were built by HCB-ANGUS and MERRYWEATHER. Thanks for the meds John, i think i will be needing a big dose, but can i be excused looking at Mann / Volvo pictures please Gents? Added by John Johnstone on 05 December 2008. Classic "City Service Ladder Truck" - quite a specialized urban apparatus, as it is a fire-truck that doesn't carry or move a drop of water. No tank, or pump. Basically, a mobile ladder and massive ladder-rack; along with access-tools, etc in the compartments [Lockers]. Possibly old enough to have carried the semi-circular shape of a folded-up Rescue Net [Jumping Net] on its trailer running-board. There are some photos of it on "Flickr" - a photo web-site - just try "Slab City Fire Dept" on your Search Engine. Many thanks to The Fireman for bringing us this Classic. Hope it has been taken to a good home. Added by Pat Rivers-Bowerman on 05 December 2008. Thank you John. I know a new term (swedish disease).LOL, Firemen have the best sense of humour. Added by George frankenfield on 05 December 2008. John, you missed out Dennis! Or is that North Yorkshire bias? Added by John Stott on 06 December 2008. Sad thing is North Torks will never buy Dennis again, so we are stuck with converted bin waggons from Ikea ( Volvo ) and Merc. Cheers John, hope you are well mate! Added by John Johnstone on 06 December 2008. I am ok John thanks, this Maxim looks like a well built machine and I know what you mean about it having an appeal! A lot of the older American stuff has a charm about it. Still not as classy as a Merryweather though! Added by John Stott on 08 December 2008. These were well built machines!Maxim was one of the best, their employees really cared about the company and were very loyal.It is a shame that all american fire trucks(or appliance as some call them)all look the same today.we have trucks taht are 50= years old that can out pump the ones. Added by George frankenfield on 08 December 2008. George, I think its the same the whole world over, I am in farming now and tractors are the same. My most reliable is a 35 year old from JD, a US built one! Added by John Stott on 09 December 2008. Slab City FD - is someone having us on ? Web-searching for this old girl's history; and the only Slab City that comes up is located near Niland, Imperial County, in Colorado Desert, in SE California, US of A. It is a vagabonding community - no "gummint" - of squatters and RV folk (Recreational Vehicle - caravans, motor-homes, such-like) including "Snow-birds" who flee southward from the cold, snowy winters( we are still sitting in the white stuff up here - Brrrr ), for the mild winter climate here. Formerly, the abandoned WW-2 US Marine Corps Camp Dunlap; got its current name from all the remaining concrete slabs and pylons - perfect, for parking the RV on. There can't be much water there - OK, so this Aerial has no pump; and there would not be any structures over 1 storey high, requiring an Aerial Ladder. Can any Knowledgeable Reader please enlighten ? Added by Pat Rivers-Bowerman on 29 March 2009. This may be the last time anyone would ever see it again. Glad you got the shot, now we all can see this old TD Aerial truck anytime we want to look back. The Fireman caught it, how appropriate. Added by Howard A. Baldwin on 18 November 2012.